Slicker sound since (Spike) Jones' heyday. The Clams came closer than most with 'Close to You'." "Why do birds suddenly appear, every time I come near? Just like you, they long to be, close to me!" Jordan R. Young, "Spike Jones Off The Record: The Man Who Murdered Music"
The 3rd edition of Spike Jones Off the Record: The Man Who Murdered Music by Jordan R. Young. Expanded and updated! If it'll make you feel any better, other music scholar-types have wasted time here. but you can hear it for free! Click on The Clam to listen. This, you can buy. Click on it to learn more. The Clams was a 70s novelty band. Most accurately described in current terms, it was a Spike Jones tribute band. The band lasted two days, did one recording session, played no live gigs, had a bonafide national top-40 hit single that sold less than 100 copies, and faded quickly into history. Later on The Clams returned to the studio and did five more tracks, trying for an album deal. Nobody was interested. (Same history as above, except without the hit single part.) They also did some Doctor Pepper radio commercials for Don Elliott Productions which were summarily rejected by the ad agency's executive producer, who claimed that when they asked for 'humor', they didn't mean 'that'. Q. Where did the name come from? A. The band's name intends no risqu� or double entendre meaning; so cleanse your mind! A clam is musicians' slang for a wrong note. The name prompted several working titles for the album, although the album never got made. Under consideration were, "The Clams: Live at the Casino", "The Clams: On The Half Shell", "The Clams: Fried!" You get the idea. Q. Can I buy those albums? A. No. Pay attention please. You can't buy those albums; They never got made. You might find the single on Ebay, but that's it. Q. Is there a Clams album reissue available on CD? A. The album never existed, so how could it be reissued on CD? Shmuck! 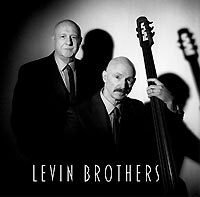 The Clams was the inspiration of bassist TONY LEVIN (Peter Gabriel, King Crimson) who brought the project to his brother, keyboardist PETE LEVIN (Gil Evans, Annie Lennox) in 1974. Both grew up listening to Spike Jones and Stan Freberg and are still big fans. The collaboration produced two tracks in the style of Spike Jones' manic City Slickers band, utilizing Spike's formula of satirizing currently popular songs. "Cocktails For Two" was a major hit record in Spike's day, and a juicy target for his brand of satire. 24 years after Spike's death, Burt Bacharach's "Close To You" was a chart-topping recording, featuring Karen Carpenter's sensitive, award-winning vocal performance. Possibly the most-requested wedding song during that period, it was a beautiful, tender ballad just waiting for someone to come along and trash it. Accordingly, The Clams' rendition - up-tempo ragtime "corn" - is peppered with gun shots, duck calls, glass smashing, slide whistles, alarm clocks, etc. ... your basic love song. We can't speak for the Carpenters, but for the Clams, good taste was never a consideration. Tony and Pete brought several friends into the project. Drummer STEVE GADD (Paul Simon, Eric Clapton), pianist/musicologist MICHAEL HOLMES and guitarist/washboardist VINNIE PASTERNACK. Grammy award winner DIXON VAN WINKLE came on board to engineer the session. (Dixon also took a tuba solo, but due to length considerations it was edited out of the single release version. You had to keep it under 3 minutes back then.) Tony played bass, and also took a lead solo on saw. (Yes, "saw" ... that's not a typo) Pete played banjo; Tony, Pete & Vinnie did the SFX, vocals and the kazoo ensemble chorus. Looking for a different sound, Steve laid down the groove with brushes on a New York City phone book. The session went down over a weekend at A&R Studios on 48th street in New York City. Not counting one unfinished track ("The Godfather Does The Soft-shoe") the Clams session produced two covers, The Carpenters' "Close To You" and Roberta Flack's "The First Time Ever I Saw Your Face", subsequently released as the A and B sides of a 45 single by Three Brothers, a sub-division label of the giant CTI Records. Unfortunately Creed Taylor hadn't authorized spending any money on promotion, so CTI just pressed enough copies to send to radio stations and called it a day, probably hoping that nobody would notice. That would have been the end of the story but for Bruce "Cousin Brucie" Morrow. Bruce was the #1 disk jockey on New York's WNBC, at that time one of the most influential top-40 AM radio stations in the country. Making no bones about it, Bruce thought the record was musical garbage. Undoubtedly having a bad hair day, he played "Close To You" to show his listeners the kind of crap he got in the mail every day from record companies. Much to everyone's surprise, the phones 'lit up': His radio audience loved it, and "Close To You" was officially added to the station's play-list. In the days following, as these things go, top 40 stations all over the country picked it up because WNBC was on it. For 2 or 3 weeks, The Clams' "Close To You" was a national turntable hit and The Clams were a household word, demonstrating yet again that in America, poor taste is contagious. By the way, it's an antiquated term now, but a "turntable hit" meant a record is very popular on the radio but you can't buy it anywhere. Remember, CTI hadn't pressed enough to send to stores. The only one who emerged unscathed was composer Burt Bacharach, whose ASCAP check presumably went up a notch. Other than that, "Close To You" (The Clams' version, not The Carpenters' ) was an enormous flop, financial and otherwise. * Three Brothers, created as a new pop division of CTI, released a total of two recordings (The Clams' single being one) and went out of business. * The much larger parent label, CTI, overextended and having major financial problems, eventually closed its doors too. * Inspired by his listeners' enthusiastic response to The Clams, Cousin Brucie started a "Bomb Of the Week" segment on his show, but it fizzled out within a month. * WNBC is now a 24-hour news and talk radio station - no music. * Bruce Morrow moved on to doing freelance commercial voice-over work. Later he joined WCBS-FM and had a street named after him in New York. * Engineer/producer Phil Ramone sold A&R Studios, which later went out of business. * Pete, who sang lead on "Close To You", was never asked to sing lead again by anybody. * Tony, possibly one of the most recorded and most recognizable pop bassists in the business, never got another chance to play saw: That's his only recorded performance. Not to say that all that was precipitated by the Clams recording. We'd like to think it was all going to happen anyway. Gosh, we were just having some fun! * The 48th street A&R studio space is now the offices of American Federation of Musicians, local 802. Impress your friends! * More trivia: There was a rumor that Steve Gadd wanted to record the basic track for Paul Simon's "Late In The Evening" drumming on a phone book, but Paul insisted that playing with 2 drumsticks in each hand was much funnier. This probably isn't true. * And more trivia: At the height of their popularity during the mid-70s, The Carpenters had a weekly network TV variety show. On one of the shows - right after The Clams' release - they put together a Spike Jones-style backup band and performed the Clams' arrangement of "Close To You". So, if you're following this: The Clams covered the Carpenters' hit record; Then The Carpenters covered the Clams' hit record. That's got to be some kind of music history landmark. A few years ago Pete ran into Bruce Morrow in a New York recording studio; Bruce was doing a voice-over for a commercial. Pete introduced himself and thanked him for breaking the Clams way back then. Bruce denied any recollection of the record or the band. Now there's a testimonial! Show biz; its a jungle out there! Now, you know. Keep reading and you'll know more! excerpted from his DISCOGRAPHY & HISTORY OF CTI RECORDS. This section was added August 1998. "Creed Taylor left Verve Records in November 1967 to align himself with trumpeter Herb Alpert's successful independent pop label, A&M Records. Taylor was guaranteed $1,000,000 over a five-year period by Alpert's company. A&M distributed CTI records, with their distinctive white borders and classic Pete Turner photography on the cover (featuring a prominently-placed CTI logo), from 1967 through 1970. "Gathering early critical and (especially substantial) financial success, Taylor launched CTI Distributing Corp. in mid 1972. This overly ambitious entry into the "rack-jobbing" business represented Taylor's effort to control and maximize the distribution of his company's product to retail outlets throughout North America. This uniquely unprecedented concept proved to be more difficult - and more outrageously expensive - than Taylor anticipated and, by 1974, brought about extreme financial hardship to the company. Despite basking in the success of his company's largest-ever hit (the Top 10, Grammy-winning "Also Sprach Zarathustra" by Deodato), Taylor was forced into a distribution arrangement with Motown Records. "At this point in 1974 (beginning approximately with CTI 6040 S1), the first generation of CTI "stars" (Freddie Hubbard, Stanley Turrentine and George Benson) were leaving for or seeking more lucrative contracts at major labels while the next generation of jazz lights were finding new life at CTI (Milt Jackson, Bob James, Paul Desmond and Chet Baker). Motown Records distributed much of CTI's product through early 1977 (ending with CTI 6072 S1) and Taylor, whose distribution network had long since shut down, initiated litigation proceedings against the Detroit giant (which ended up getting Grover Washington, Jr. out of the deal)." "Devised as a "popular" subsidiary of Creed Taylor, Inc., Three Brothers (the name of one of CTI's publishing companies) issued one album by Lou "Lightning Strikes" Christie in 1974 and a 45 by The Clams, a "Spike Jones tribute band" featuring bassist Tony Levin, his brother keyboardist Pete Levin and drummer Steve Gadd. The Clams single became a Top 40 hit, even though only 100 promotional 45s were issued. The Lou Christie album, produced by Tony Romeo, resulted in quite a number of 45s issued between December 1973 and December 1974." Now, you know a lot! Impress your friends!